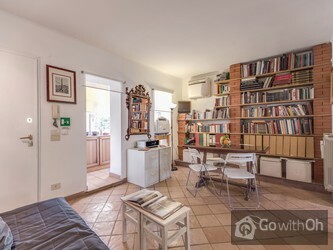 This beautiful 55 m2 apartment can comfortably sleep up to four people and is located on the third floor (without a lift) of a historical palatial residence just ten minutes from the Coliseum. The privileged location allows visitors to walk to the most important tourist and cultural attractions in the Eternal City. The famous "Via dei Fori Imperiali" is just a short stroll away and it is only 5 minutes to the metro station "Colosseo". There are also a large number of bus services running in the area that provide quick and easy transport all over the city. The apartment has been recently reformed and includes all mod cons to make guests feel completely at home. The main entrance opens onto a lounge with comfortable double sofa bed, a table, chairs and LCD television that create the perfect atmosphere for unwinding after long days of sightseeing around Rome. 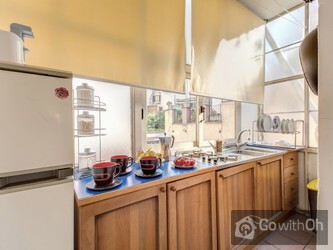 Slightly apart, the modern fully-equipped American-style kitchen has large windows and offers a very sunny atmosphere. The spacious and comfortable double bedroom has a large wardrobe for guests to store their belongings and a second LCD television. Finally although no less important the spacious well-fitted bathroom has a shower cabin. Air conditioning and WIFI internet connection is available throughout the house. Check-ins between 08pm and 7 am will have a surcharge of 30. Check-in/out on Sundays and italian Bank Holidays will incur a surcharge of 30 (all day). 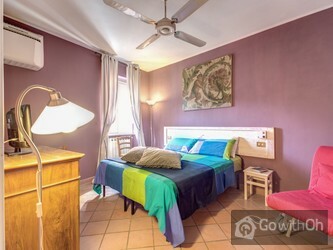 The apartment is located approximately 2 hours by public transport and 1 hour by taxi from the airport. In case of a delay of 1 hour or more regarding to the agreed arrival time, a surcharge of 20 applies, which has to be paid upon arrival. This surcharge will not apply if the customer gives notice of the delay at least 1 hour in advance. This was a great location -- close to restaurants, the metro, shops and of course the Colosseum, Trajan's Market, etc. Roomy enough for the 3 of us. Also, very quiet neighborhood which was great. Three flights up were no problem -- even after a long day of walking around -- so don't let the lack of ...a lift deter you. WiFi worked well although a bit slow in the evenings. 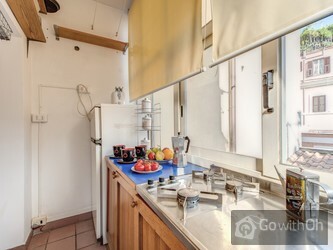 Kitchen is very small but you won't need to cook because it is easy to find something to eat close by. Muy buena ubicacion, muy centrica y al lado de Coloseo. El piso pequenito, pero perfecto para 4 personas. El hombre que nos atendio muy bueno, solo que el ultimo dia nos quito 50 eur de fianza por una persiana que enrealidad ya estaba rota. The apartment was just a few minutes walk from the Coliseum so location was perfect. It was great for just the 2 of us - we thought it looked bigger on the website but we spent most of our day out doing tourist stuff so the small kitchen didn't get used much anyway. The 2 single beds were ...comfortable and there was also a fold out double sofa. Everything was supplied, towels and bedding etc and a well stocked kitchen. There's a bit of personal 'stuff' in the apartment - its almost like someone has moved out so we could rent it for a short time. G is a lovely man - he gave us lots of useful information and was prompt in being there when we arrived and departed. 8/10 Appartement idéalement situé au pied du Colisée dans une petite ruelle piétonne. Tout équipé, que ce soit dans la cuisine, la salle de bain ou la chambre, il ne manquait rien. Excellent rapport qualité/prix. Ganz tolle Lage, man konnte alles zu Fuss machen. Die Wohnung war OK für den Preis. Sehr netter Kontakt in Rom, wir haben viele Tipps bekommen, auch wo man gut essen kann. Couple with toddler. 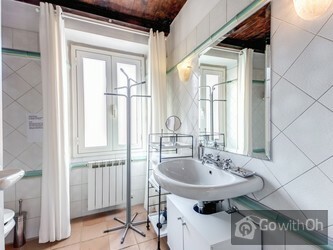 The location is excellent, and the apartment is clean and functional. The owner is very accomodating and friendly. Would recommend, especially to couples looking to see the sights. Very sweet little apartment. The couch bed was very comfortable and easy to make up every day. Excellent location. Kitchen was tiny but usable. Great air-conditioning. Stairs were a bit tough but I'd stay there again. Leider gab es ein Missverständnis im Bezug auf die Schlüsselübergabe, wodurch wir 2 Stunden warten mussten. das war bedauerlich. In der Küche der Wohunung gibt es kein Licht, das sollte geändert werden. 3 étages avec un escalier raide et étroit. La persona que nos hizo entrega de llaves, 0 trato con el cliente. Escasa iluminación y en mal estado. Higiene de baño mejorarle, da la impresión que el vive ahí menos cuando lo alquila. Ficheros en salón, armario con candado, palangana en el baño como en un geriátrico. Muy buena ubicación y silencioso, pero no lo recomiendo. Estimado Cliente, Desde Oh le damos las gracias por sus comentarios. El propietario garantiza un servicio de limpieza completo y eficaz y proporciona toda la información necesaria sobre la zona y el apartamento. 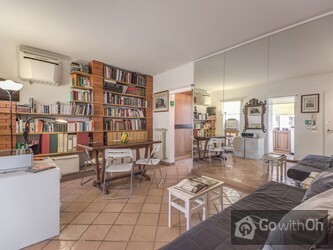 La decoración del apartamento incluye una colección de libros personales del propietario. Se nos confirma que el armario cerrado contiene ropa de cama y toallas que se utilizan para la limpieza final. ottima posizione, ma la pulizia un pò carente! tutto sommato ci siamo trovati bene e ci tornerei! 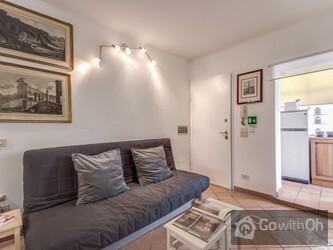 Great apartment in a great location. Wish we could have stayed longer! Très bon appartement, en plein centre avec toutes les commodités. Bon plan a Rome. Tiene lo necesario para pasar unos dias tranquilos . Esta en pleno centro de Roma y puedes caminar al ir o al retornar. Todo perfecto.Gente agradable y trato bueno. 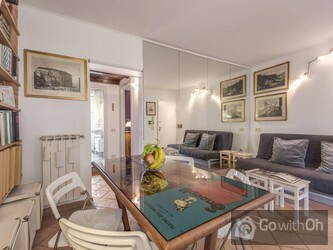 The apartment was in great location (only a few metres away Colosseo). 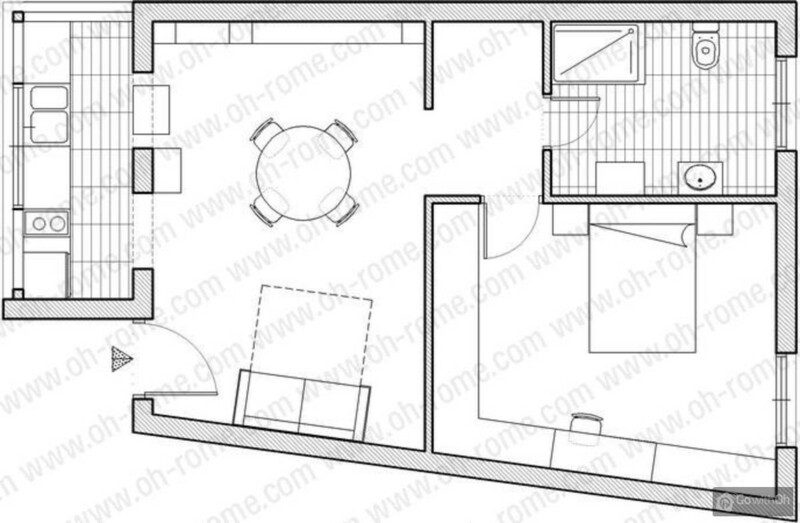 The flat is not large, but possible for four people. Kitchen was equipped enough for cooking. The flat looks much better in real than in the picture. We loved lots of books on the bookcases. Contact person was very kind. You ...recognize soon, that he is really interested in literature, art and architecture. 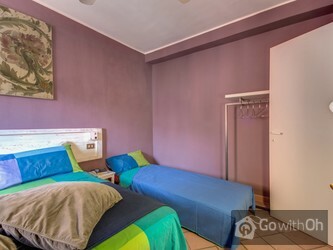 I can definitely recommend this accommodation to everybody who wants to see a real Rome. With this location, you can see the main points of Rome in three days (by walk). Appartement très bien situé, proche du Colisée et du Forum. Idéal. 15min à pied seulement de la Gare Termini. Nombreux restos dans le quartier. Immeuble calme. 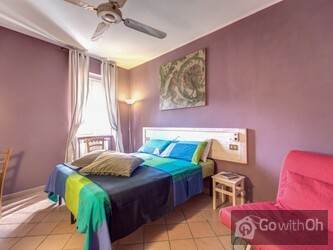 It was one of the best accommodation in Rome, in the city center but in a quiet street. I recommend this apartment for a longer stay. 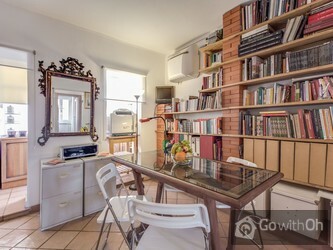 Très bonne prestation tant au niveau de l'appartement lui même, très propre, literie confortable et agencement bien pensé, que de l'accueil reçu. 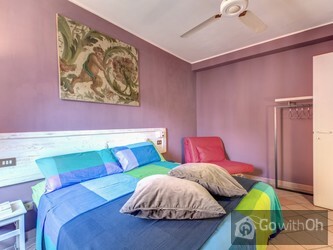 Appartement pratique, équipé, propre, joli et très bien placé tout en restant calme ! 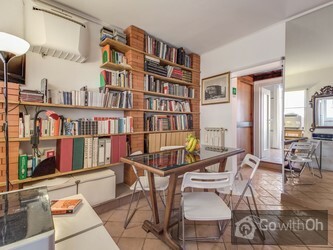 La bibliothèque foisonne de belles images et de renseignements sur Rome, l'Italie et l'art. Et pour ne rien gâcher, super accueil de G, charmant et si italien. Bref, nous savons maintenant où aller lors de notre prochain passage à Rome. 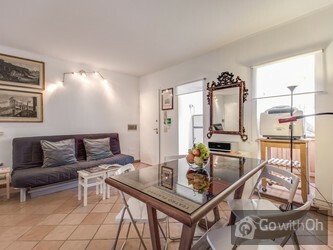 Nous avons passé un excellent séjour dans cet agréable appartement qui est idéalement situé. De plus le propriétaire est très sympathique. Je le recommande sans hésitation. Location was perfect! 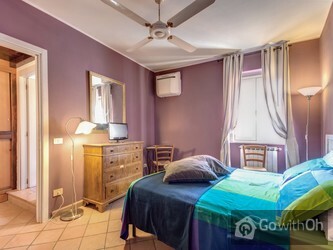 5 minutes walk from Colosseum. Owner very nice and full of useful tips. Apartment large, yet cosy, and clean! Next time in Rome I will spend in same place! ??? ???? ????? ??? ?? ???????! ???????????? ???????????? ?????? ??????? ?- ??? ?????. ???????! The apartment was in a good location especially for the start of the marathon. I would stay again but be sure to e-mail the owner of when you will arrive to avoid confusion. La situación del apartamento es excelente, cerca de puntos de interés turístico y del transporte público. Está completamente equipado, no le falta detalle. El propietario es correcto en el trato y te informa a la llegada sobre aspectos básicos como lugares donde hacer la compra y el horario de... apertura (Te deja más información en papel). Como no se puede puntuar con 9, he puesto 10 al propietario y 8 al alojamiento, pero para mi ambos son de 9 (es un tercero sin ascensor,el portal es algo estrecho y con poca luz. Al viajar con un niño de dos años, y a pesar de contar con ello, se hacía un poco pesado subir y bajar carrito y niño). Alojamiento genial, comodo, acogedor, tranquilo y muy bien situado. El propietario no estaba en el apartamento a la hora a la q habiamos quedado, aunque no tardo en presentarse despues de llamarle. Trato poco cordial y sin dar muchas facilidades. 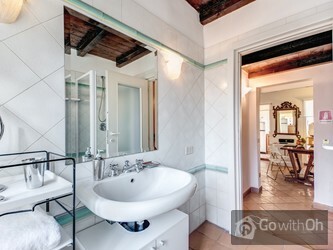 Die Wohnung ist wie auf den Fotos zu sehen, die Lage einfach unschlagbar. The appartment is simply excellent. G, the owner, is a beautiful person, gentil, punctual and dedicated. 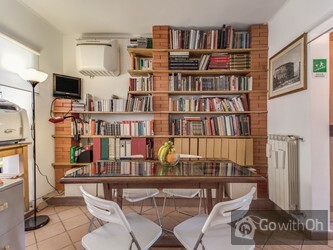 He leaves, in the appartment, a complete library (that includes Calvino and García Lorca). The apt. 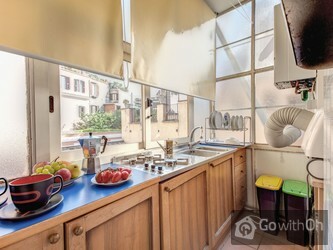 is luminous and very comfortable with everything you need to cook, stay and sleep.It is so ...well located that we were able to walk all around Rome without taking any public transport.At night, at 300mts, Monti offers beautiful restaurants with a veried offer to eat and drink.We hope to be back soon! Nur wenige Schritte vom Colosseum entfernt bietet die Ferienwohnung den idealen Ausgangspunkt , um alles zu Fuss zu erreichen. In der Umgebung befinden sich Restaurants und Einkaufsmöglickeiten. Die Wohnung ist individuell und Herr C ein wunderbarer Gastgeber. Für uns ( 3 Personen) war es ein wundervoller Urlaub.